This greenhouse is an indigently designed robust greenhouse, using the same construction method as the rest of the Alton Evolution range. The finish, attention to detail and amount of material used to manufacture it is unprecedented at this price. All of the potential ‘rot points’ have been designed out of the greenhouse. 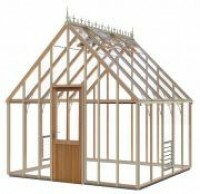 Even untreated the greenhouse is guaranteed for 10 years, treated it should last 30 – 40 years. With this new Aluminium bar capping system you really can have a virtually maintenance free cedar greenhouse.